Surely the Isle of Wight council know how many houses have been declared so unsafe they can’t be inhabited. Why are they saying it’s only one? On the day that members of the Isle of Wight council Executive Committee will be considering reports produced by Island Roads in relation to geo-technical works and the landslip on UnderCliff Drive, OnTheWight learns of a ‘discrepancy’ in council paperwork. 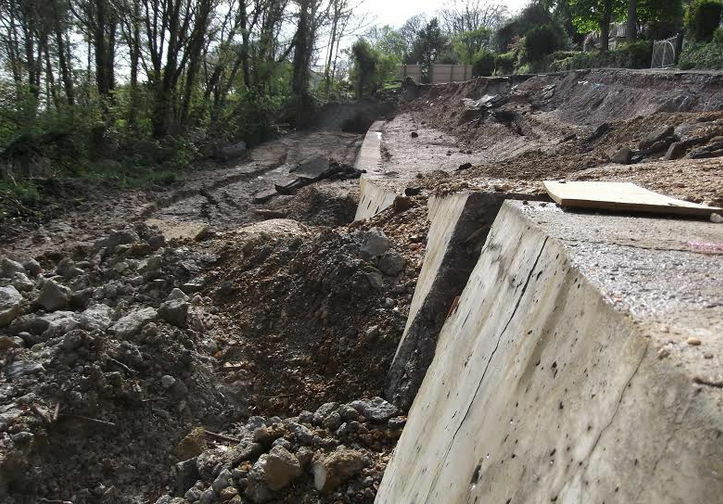 In February 2014, following a landslip on Undercliff Drive – which resulted in landlocking nine properties – one house was condemned by the Isle of Wight council. As a result of the damage caused to their home, the residents were forced to move themselves and their possessions out of the property during horrendous weather conditions in the dark of night. In all correspondence received from the council since and indeed, included in their most recent press release (dated 27th June), the Isle of Wight council still claim only one house has been condemned on Undercliff Drive since the landslip at the beginning of the year. So you can imagine our surprise when owners of a property on Undercliff Drive contacted OnTheWight, saying they’d like us to, “update your information on the facts for the Undercliff Drive residents”. They tell us their home – next to the previously condemned bungalow – was condemned by the council at the end of February/beginning of March. OnTheWight got in touch with the council asking why they have continued to claim one one property has been condemned, when residents tell us it is two. At time of publishing, we hadn’t received a response. As reported last week, chair of the IW Scrutiny Committee, Geoff Lumley, has agreed to examine a dossier – compiled by someone with first hand experience – which contains serious allegations in relation to events leading up to the landslip.